This is quite a step away from my usual offerings. I think I can count the number of French recipes on this site on one hand. Or less. Let’s see . . . Gougeres, quiche Lorraine, mushroom quiche. That’s it. 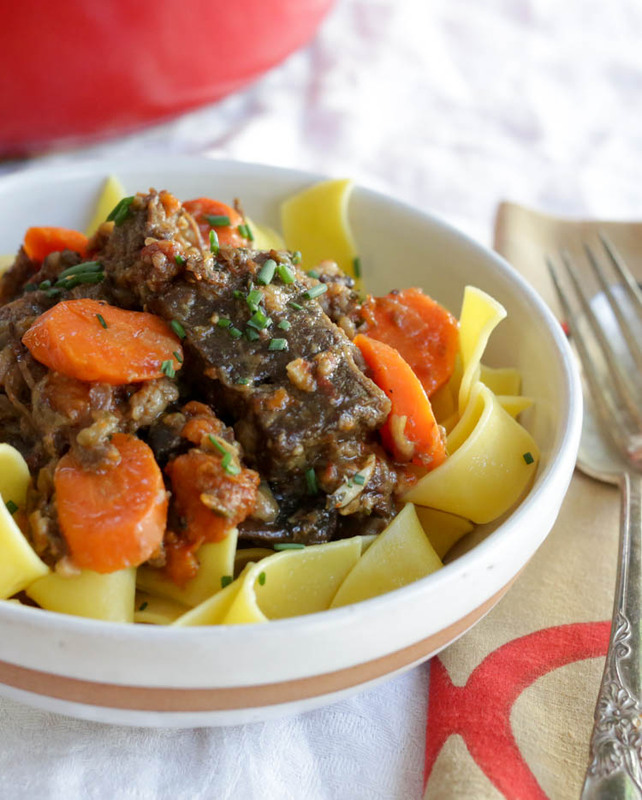 And now, this daube de boeuf which is an absolutely fantastic cold-weather recipe that’s very easy but also impressive enough for fancy guests like the Queen. Speaking of the queen, we just got back from two weeks in London, which explains my absence here on the site. I honestly thought I would do some cooking in London and share some “hotel recipes” since we did have a kitchenette, but alas, that was overly optimistic. The most I managed was a couple of grilled cheeses and peanut butter toast. I don’t think anyone needs or wants a picture of hotel toast. 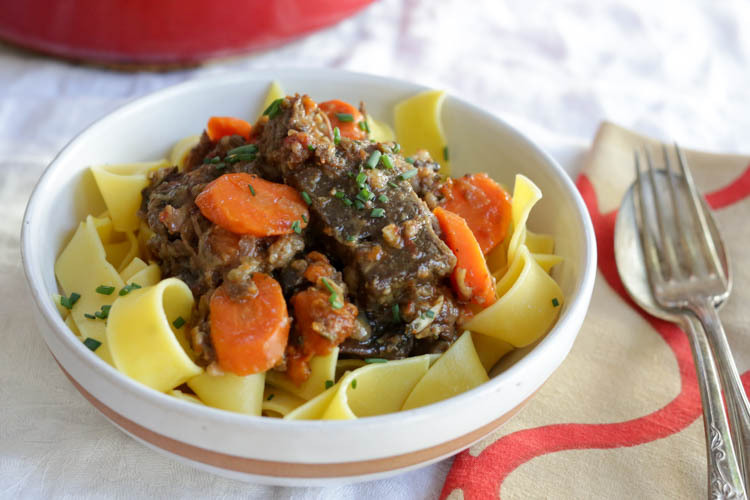 Anyway, daube de boeuf just means “braised beef” and if you know about braising, you know it’s one of the simplest, most satisfactory cooking methods of all time, especially for big hunks of meat. Most versions I found online use red wine, some use vermouth. This particular recipe uses vermouth and gin. WHAT??! I never heard of that before. I found this recipe in my grandma’s collection, but of course I had to change it a little bit. The original called for a cup of gin, which seemed kind of overkill so I cut it back. It also called for blanched bacon, but guess what, people. If you use salt pork (which is unsmoked) you don’t have to blanch anything. I increased the amount of mushrooms, too, because what good is a half-cup of sliced mushrooms to anyone? No good at all. Make sure you do the “pesto”! It was called pesto on the recipe card, but it’s not like Italian basil pesto at all. The salty, sour capers make this thing POP. You need that because the meat is very rich. I suggest stirring about half of the pesto into the pot, and serving the rest on the table. It looks really pretty blobbed on top of bowls of meat and noodles. I forgot about it when I took this picture, but look how nice green chives look, too! Serve this with some buttery nood’s or a toasted baguette and a green salad. It freezes perfectly, too. Just thaw in the fridge overnight and then reheat on the stove. Toss beef cubes with flour, salt, pepper and minced garlic. Set aside. Lay salt pork in the bottom of a Dutch oven or other heavy, large pot. Layer half the vegetables on top, then beef, then remaining vegetables. Pour vermouth and gin over all. Cover and put over high heat on the stove. Bring to simmer while the oven heats to 350ºF. Transfer to oven and bake about 3 hours. Once meat is very tender, remove from oven. Make pistou while the daube bakes: combine mashed garlic, capers, mustard, oil, parsley. Gently stir into the casserole right before serving. Give yourself 30 minutes to cut everything up. Can layer it all in a big pot and refrigerate overnight, then cook as directed. Looks awesome ! I can see the vermouth, as its kinda wine like, but the gin’s juniper, I can’t see that one.. I like to add some sour cream for a similar reason like you mentioned, in order to cut the richness and add contrast. I was so surprised by how delicious this was! I thought the gin would overpower it but it just melts into everything and tastes really rich. I think you should try it, Mike! Could I do this in a crock pot? Instead of salt pork, how about a cured duck breast with the skin still on it? But, according to your recipe it wasn’t braised. Do you brown the beef first? This is a braise. You saute it on the stove for a few minutes then transfer the closed pot to the oven.